"DLP projector" redirects here. For other projection devices, see movie projector. Digital Light Processing (DLP) is a set of chipsets based on optical micro-electro-mechanical technology that uses a digital micromirror device. It was originally developed in 1987 by Larry Hornbeck of Texas Instruments. While the DLP imaging device was invented by Texas Instruments, the first DLP-based projector was introduced by Digital Projection Ltd in 1997. Digital Projection and Texas Instruments were both awarded Emmy Awards in 1998 for the DLP projector technology. DLP is used in a variety of display applications from traditional static displays to interactive displays and also non-traditional embedded applications including medical, security, and industrial uses. DLP technology is used in DLP front projectors (standalone projection units for classrooms and business primarily), DLP rear projection television sets, and digital signs. It is also used in about 85% of digital cinema projection, and in additive manufacturing as a light source in some printers to cure resins into solid 3D objects. Smaller "pico" chipsets are used in mobile devices including cell phone accessories and projection display functions embedded directly into phones. In DLP projectors, the image is created by microscopically small mirrors laid out in a matrix on a semiconductor chip, known as a Digital Micromirror Device (DMD). These mirrors are so small that DMD pixel pitch may be 5.4 µm or less. Each mirror represents one or more pixels in the projected image. The number of mirrors corresponds to the resolution of the projected image (often half as many mirrors as the advertised resolution due to wobulation). 800×600, 1024×768, 1280×720, and 1920×1080 (HDTV) matrices are some common DMD sizes. These mirrors can be repositioned rapidly to reflect light either through the lens or onto a heat sink (called a light dump in Barco terminology). Rapidly toggling the mirror between these two orientations (essentially on and off) produces grayscales, controlled by the ratio of on-time to off-time. There are two primary methods by which DLP projection systems create a color image: those used by single-chip DLP projectors, and those used by three-chip projectors. A third method, sequential illumination by three colored light emitting diodes, is being developed, and is currently used in televisions manufactured by Samsung. Interior view of a single-chip DLP projector, showing the light path. Light from the lamp enters a reverse-fisheye, passes through the spinning color wheel, crosses underneath the main lens, reflects off a front-surfaced mirror, and is spread onto the DMD (red arrows). From there, light either enters the lens (yellow) or is reflected off the top cover down into a light-sink (blue arrows) to absorb unneeded light. Top row shows overall components, closeups of 4-segment RGBW color wheel, and light-sink diffuser/reflection plate on top cover. In a projector with a single DLP chip, colors are produced either by placing a color wheel between a white lamp and the DLP chip or by using individual light sources to produce the primary colors, LEDs or lasers for example. The color wheel is divided into multiple sectors: the primary additive colors: red, green, and blue, and in many cases white (clear). Newer systems substitute the primary subtractive colors cyan, magenta, and yellow for white. The use of the subtractive colors is part of the newer color performance system called BrilliantColor which processes the additive colors along with the subtractive colors to create a broader spectrum of possible color combinations on the screen. The DLP chip is synchronized with the rotating motion of the color wheel so that the green component is displayed on the DMD when the green section of the color wheel is in front of the lamp. The same is true for the red, blue and other sections. The colors are thus displayed sequentially at a sufficiently high rate that the observer sees a composite "full color" image. In early models, this was one rotation per frame. Now, most systems operate at up to 10× the frame rate. The black level of a single-chip DLP depends on how unused light is being disposed. If the unused light is scattered to reflect and dissipate on the rough interior walls of the DMD / lens chamber, this scattered light will be visible as a dim gray on the projection screen, when the image is fully dark. Deeper blacks and higher contrast ratios are possible by directing unused HID light away from the DMD / lens chamber into a separate area for dissipation, and shielding the light path from unwanted internal secondary reflections. The rainbow effect found in DLP projectors utilizing a mechanical spinning wheel. DLP projectors utilizing a mechanical spinning color wheel may exhibit an anomaly known as the "rainbow effect". This is best described as brief flashes of perceived red, blue, and green "shadows" observed most often when the projected content features high contrast areas of moving bright or white objects on a mostly dark or black background. Common examples are the scrolling end credits of many movies, and also animations with moving objects surrounded by a thick black outline. Brief visible separation of the colours can also be apparent when the viewer moves their eyes quickly across the projected image. Some people perceive these rainbow artifacts frequently, while others may never see them at all. This effect is caused by the way the eye follows a moving object on the projection. When an object on the screen moves, the eye follows the object with a constant motion, but the projector displays each alternating color of the frame at the same location for the duration of the whole frame. So, while the eye is moving, it sees a frame of a specific color (red, for example). Then, when the next color is displayed (green, for example), although it gets displayed at the same location overlapping the previous color, the eye has moved toward the object's next frame target. Thus, the eye sees that specific frame color slightly shifted. Then, the third color gets displayed (blue, for example), and the eye sees that frame's color slightly shifted again. This effect is not perceived only for the moving object, but the whole picture. Multi-color LED-based and laser-based single-chip projectors are able to eliminate the spinning wheel and minimize the rainbow effect, since the pulse rates of LEDs and lasers are not limited by physical motion. "Three-chip DLP projectors have no color wheels, and thus do not manifest this [rainbow] artifact." A three-chip DLP projector uses a prism to split light from the lamp, and each primary color of light is then routed to its own DMD chip, then recombined and routed out through the lens. Three chip systems are found in higher-end home theater projectors, large venue projectors and DLP Cinema projection systems found in digital movie theaters. According to DLP.com, the three-chip projectors used in movie theaters can produce 35 trillion colors. The human eye is suggested to be able to detect around 16 million colors, which is theoretically possible with the single chip solution. However, this high color precision does not mean that three-chip DLP projectors are capable of displaying the entire gamut of colors we can distinguish (this is fundamentally impossible with any system composing colors by adding three constant base colors). In contrast, it is the one-chip DLP projectors that have the advantage of allowing any number of primary colors in a sufficiently fast color filter wheel, and so the possibility of improved color gamuts is available. DLP technology is light-source agnostic and as such can be used effectively with a variety of light sources. Historically, the main light source used on DLP display systems has been a replaceable high-pressure xenon arc lamp unit (containing a quartz arc tube, reflector, electrical connections, and sometimes a quartz/glass shield), whereas most pico category (ultra-small) DLP projectors use high-power LEDs or lasers as a source of illumination. For xenon arc lamps, during start-up, the lamp is ignited by a 5–20-kilovolt pulse from a current-regulating ballast to initiate an arc between two electrodes in the quartz tube. After warmup, the ballast's output voltage drops to approximately 60 volts while keeping the relative[clarify] current high. As the lamp ages, the arc tube's electrodes wear out and light output declines somewhat, while waste heating of the lamp increases. The lamp's end of life is typically indicated by an LED on the unit or an onscreen text warning, necessitating replacement of the lamp unit. When a lamp is operated past its rated lifespan, the efficiency declines significantly, the lightcast may become uneven, and the lamp starts to operate extremely hot, to the point that the power wires can melt off the lamp terminals. Eventually, the required startup voltage will also rise to the point where ignition can no longer occur. Secondary protections such as a temperature monitor may shut down the projector, but a thermally overstressed quartz arc tube can also crack and/or explode. However, practically all lamp housings contain heat-resistant barriers (in addition to those on the lamp unit itself) to prevent the red-hot quartz fragments from leaving the area. The first commercially available LED-based DLP HDTV was the Samsung HL-S5679W in 2006, which also eliminated the use of a color wheel. Besides long lifetime eliminating the need for lamp replacement and elimination of the color wheel, other advantages of LED illumination include instant-on operation and improved color, with increased color saturation and improved color gamut to over 140% of the NTSC color gamut. Samsung expanded the LED model line-up in 2007 with products available in 50-, 56- and 61-inch screen sizes. In 2008, the third generation of Samsung LED DLP products were available in 61" (HL61A750) and 67" (HL67A750) screen sizes. Ordinary LED technology does not produce the intensity and high-lumen output characteristics required to replace arc lamps. The special patented LEDs used in all of the Samsung DLP TVs are PhlatLight LEDs, designed and manufactured by US-based Luminus Devices. A single RGB PhlatLight LED chipset illuminates these projection TVs. The PhlatLight LEDs are also used in a new class of ultra-compact DLP front projector commonly referred to as a "pocket projector" and have been introduced in new models from LG Electronics (HS101), Samsung electronics (SP-P400) and Casio (XJ-A series). Home Theater projectors will be the next category of DLP projectors that will use PhlatLight LED technology. At InfoComm, June 2008 Luminus and TI announced their collaboration on using their technology on home theater and business projectors and demonstrated a prototype PhlatLight LED-based DLP home theater front projector. They also announced products will be available in the marketplace later in 2008 from Optoma and other companies to be named later in the year. Luminus Devices PhlatLight LEDs have also been used by Christie Digital in their DLP-based MicroTiles display system. It is a modular system built from small (20 inch diagonal) rear projection cubes, which can be stacked and tiled together to form large display canvasses with very small seams. The scale and shape of the display can have any size, only constrained by practical limits. The first commercially available laser-based DLP HDTV was the Mitsubishi L65-A90 LaserVue in 2008, which also eliminated the use of a color wheel. Three separate color lasers illuminate the digital micromirror device (DMD) in these projection TVs, producing a richer, more vibrant color palette than other methods. See the laser video display article for more information. DLP Cinema systems have been deployed and tested commercially in theatres since 1999. In June 1999, Star Wars: Episode I – The Phantom Menace was the first movie to be entirely scanned and distributed to theaters. Four theaters installed digital projectors for the movie's release. The same was done for the traditional and computer-animated hybrid film Tarzan that same year. Later that year, Toy Story 2 was the first movie to be entirely created, edited, and distributed digitally, with more theaters installing digital projectors for its release. 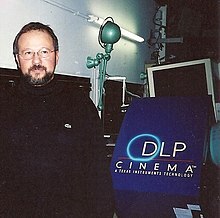 DLP Cinema was the first commercial digital cinema technology and is the leading digital cinema technology with approximately 85% market share worldwide as of December 2011. Digital cinema has some advantages over film because film can be subject to color fading, jumping, scratching and dirt accumulation. Digital cinema allows the movie content to remain of consistent quality over time. Today, most movie content is also captured digitally. The first all-digital live action feature shot without film was the 2002 release, Star Wars Episode II: Attack of the Clones. DLP Cinema does not manufacture the end projectors, but rather provides the projection technology and works closely with Barco, Christie Digital and NEC who make the end projection units. DLP Cinema is available to theatre owners in multiple resolutions depending on the needs of the exhibitor. These include, 2K – for most theatre screens, 4K - for large theatre screens, and S2K, which was specifically designed for small theatres, particularly in emerging markets worldwide. 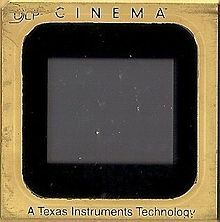 On February 2, 2000, Philippe Binant, technical manager of Digital Cinema Project at Gaumont in France, realized the first digital cinema projection in Europe with the DLP CINEMA technology developed by Texas Instruments. DLP is the current market-share leader in professional digital movie projection, largely because of its high contrast ratio and available resolution as compared to other digital front-projection technologies. As of December 2008, there are over 6,000 DLP-based Digital Cinema Systems installed worldwide. DLP projectors are also used in RealD Cinema and newer IMAX theatres for 3-D films. Since being introduced commercially in 1996, DLP technology has quickly gained market share in the front projection market and now holds greater than 50% of the worldwide share in front projection in addition to 85% market share in digital cinema worldwide. Additionally, in the pico category (small, mobile display) DLP technology holds approximately 70% market share. Over 30 manufacturers use the DLP chipset to power their projection display systems. Smooth (at 1080p resolution), jitter-free images. Perfect geometry and excellent grayscale linearity achievable. The use of a replaceable light source means a potentially longer life than CRTs and plasma displays (this may also be a con as listed below). The light source is more-easily replaceable than the backlights used with LCDs, and on DLPs is often user-replaceable. The light from the projected image is not inherently polarized. New LED and laser DLP display systems more or less eliminate the need for lamp replacement. DLP offers affordable 3D projection display from a single unit and can be used with both active and passive 3D solutions. Lighter weight than LCD and plasma televisions. Unlike their LCD and plasma counterparts, DLP screens do not rely on fluids as their projection medium and are therefore not limited in size by their inherent mirror mechanisms, making them ideal for increasingly larger high-definition theater and venue screens. DLP projectors can process up to seven separate colors, giving them a wider color gamut. The rear panel of a Mitsubishi XD300U shows the output and input jacks which are available. Some viewers are bothered by the "rainbow effect" present in colour-wheel models - particularly in older models (explained above). This can be observed easily by using a camera's digital viewfinder on projected content. Replacement of the lamp / light bulb in lamp-based units. The life span of a arc lamp averages 2000–5000 hours and the replacement cost for these range from $99 – 350, depending on the brand and model. Newer generations' units use LEDs or lasers which effectively eliminate this issue, although replacement LED chips could potentially be required over the extended lifespan of the television set. Some viewers find the high pitch whine of the color wheel to be an annoyance. However, the drive system can be engineered to be silent and some projectors don't produce any audible color wheel noise. Dithering noise may be noticeable, especially in dark image areas. Newer (post ~2004) chip generations have less noise than older ones. Response time in video games may be affected by upscaling lag. While all HDTVs have some lag when upscaling lower resolution input to their native resolution, DLPs are commonly reported to have longer delays. Newer consoles that have HD output signals do not have this problem as long as they are connected with HD-capable cables. May use more electricity, and generate more heat, than competing technologies. The most similar competing system to DLP is known as LCoS (liquid crystal on silicon), which creates images using a stationary mirror mounted on the surface of a chip, and uses a liquid crystal matrix (similar to a liquid crystal display) to control how much light is reflected. DLP-based television systems are also arguably considered to be smaller in depth than traditional projection television. ^ Texas Instruments. "DLP3010 Mobile HD Video and Data Display Description & parametrics". Retrieved 2014-10-13. ^ The Great Technology War: LCD vs. DLP. By Evan Powell, December 7, 2005. Accessed online at: http://www.projectorcentral.com/lcd_dlp_update7.htm?page=Rainbow-Artifacts. Accessed on Dec. 27, 2011. ^ "Luminus Devices' PhlatLight LEDs Illuminate Christie MicroTile's New Digital Canvas Display". Businesswire. Archived from the original on 2012-09-19. ^ Cahiers du cinéma, n°hors-série, Paris, April 2000, p. 32. ^ TI (2008-02-15). "European Cinema Yearbook". Mediasalles. Retrieved 2008-02-15. ^ "DLP TV : Why Is There A Noise Coming From My DLP TV?". Archived from the original on 2010-10-05. ^ "Samsung LNT2653H 26-Inch LCD HDTV forum: High pitched noise". ^ "Ecoustics: Noise with the Samsung DLP HLP series". ^ "HDTVs and Video Game Lag: The Problem and the Solution". AVS Forum. 2005-07-11. Retrieved 2007-08-13. ^ "4 styles of HDTV". CNET.com. 2007-03-13. Retrieved 2007-08-13. Binant, Philippe. Au coeur de la projection numérique, Actions, 29, 12–13, Kodak, Paris, 2007. Swartz, Charles S., ed. (2005). Understanding Digital Cinema: A Professional Handbook. Taylor & Francis. ISBN 978-0-240-80617-4.